It was only a matter of time before this was going to happen. 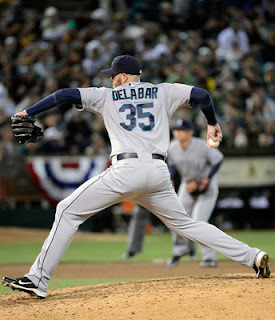 Steve Delabar was demoted to AAA Tacoma after tonights offensive outburst by the Mariners. In such a celebration of the 21 - 8 victory over the Texas Rangers, Delabar was probably not wearing his party hat. Getting news like this is never fun. Delabar had a 1 and 1 record with a 5.18 ERA, giving up 14 runs in 24.1 innings pitched. Half of those hits were homers. Not the typical productivity for a pitcher to remain on a Major League roster, but we've seen worse. The question remains, who is going to be joining the team in Delabar's spot? 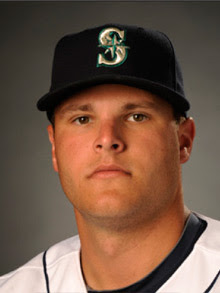 Rumor has it that prospect Stephen Pryor could be joining the team after a stellar beginning of the year between Jacksonville and Tacoma. Between the two, Pryor has given up only 2 runs in 28 innings and holds down a 0.64 ERA allowing just 12 hits and 0 homers. Pryor has walked only 12 batters while striking out 39. Not too shabby. The only other option would be to bring up rookie Erasmo Ramirez into the starting rotation, but one would assume that Delabar would not be the one on his way out. If so, you would expect Ramirez to be back in the pen and it would look like the M's would be going through a Brandon Morrow situation all over again. Hopefully that is not the case. So, as the M's head out of Arlington on their way to Chicago, one player will be meeting them there and take a spot on the 25 man roster. Again, there is speculation that it is Stephen Pryor, but, we'll have to wait and see!